Editor’s note: Do you have a story of a treasured family heirloom? Or maybe a distinct way you’re using an heirloom in your home? We’d like to hear about it, send to tips[at]inmenlo.com. “The decision to send it to Turkey was because the repairs were so massive,” explained Stephen. “Not only are there far more weavers — allowing the workshop to weave more economically — but another reason is that we wanted to use old wool, to better replicate the fleecy quality of the wool that was originally used. 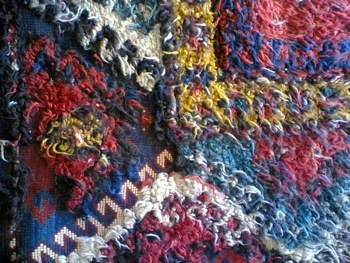 “In Turkey there is far greater access to old kilims, (flat-woven rugs), which are used as a source of the wool for knotting. 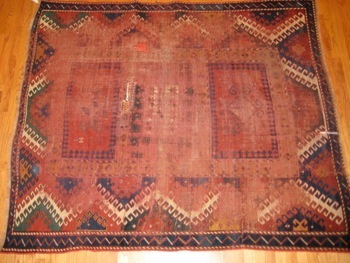 These kilims are taken apart and the wool is re-spun and used in antique rug repair. It returned no longer really an antique rug — there is too much modern work. At the same time, it came back to Menlo Park as a beauty. 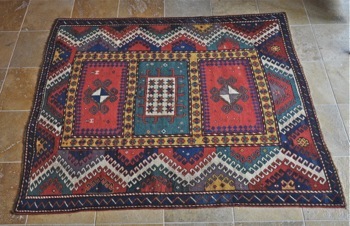 Note: Search the Internet, and you’ll find that rugs of this age and origin are now considered works of art, best preserved under glass or hung from a wall. Stephen’s customer is pleased that she can put it back on the floor, although not in a well-trafficked area of her home.